What is a Remote SureStop Water Switch? SureStop is a revolutionary product which uses servo valve technology to enable the cold water supply to be remotely turned on and off at the flick of a switch. No electricity or additional power supplies are required. SureStop helps minimise damage caused by water leaks and burst pipes. No additional power source reqrd. Overcomes all the problems associated with the use of brass stop valves. Easily fitted to any 15mm mains water supply. Safe. 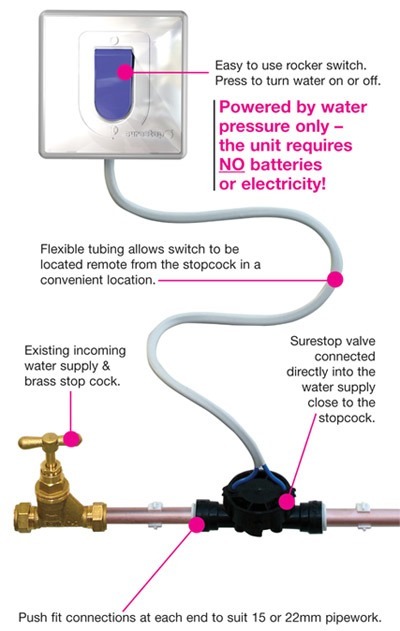 SureStop can be used by everyone to turn off the mains water supply. SureStop can be used where there is a mains water supply using 15 mm pipe work, which needs to be turned off at anytime. Fast switch off for your water supply. SureStop can be used whenever you want – when you go on holiday – when you go out for the night – when you go to bed. Using SureStop on a frequent basis can prevent catastrophic damage through burst pipes. SureStop means that you will know where to switch the water off. SureStop can be used for zoned switching. SureStop can be fitted in any orientation and it will still work. Water leaks and burst pipes can cause serious damage and are one of the main causes of domestic floor disasters in the UK.The amount of damage a water leak can cause can be significantly reduced if the water supply can be turned off quickly. This is often not possible as stop valves are usually located in an out of the way position, for example, under the sink. It can be a struggle to turn these valves off, especially if you are elderly or disabled. Also, unless serviced regularly, brass stop valves easily scale and seize up, particularly in hard water areas. SureStop water stop valves can ensure that the water supply can be turned off within seconds at the flick of a switch. Remote SureStop water stop valves can also be purchased from Michael The Plumber for £49.99 inclusive of p&p.